Last night I dreamt about Kintsugi. I dreamt that I had a turquoise coloured bowl, which I had dropped and it had broken in two. I took it to an artisan who practiced Kintsugi, who repaired it for me. The broken bowl came back to me with a beautiful gold seam running across where the break had been. 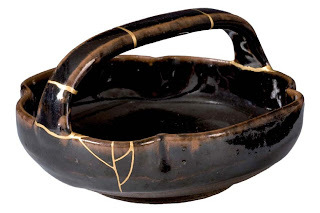 The art of Kintsugi originated in Japan. Broken ceramic and porcelain items are repaired using a technique of applying a lacquer that is inlaid with gold. The broken item comes back even better than new, which is the whole idea. The idea was to make something truly beautiful out of something that was once broken and unwanted. It's a wonderful metaphor for life. My life, at least. I can't speak for anyone else's. I admit that I have been a broken human being. I see that, acknowledge it and accept it. For me, Nichiren Buddhism became my Kintsugi and I am sure there are dozens of seams of gold running through me. Not only repaired, but better than before. I don't think you have to be a Nichiren Buddhist to appreciate how we've been shaped by adversity and how each obstacle has been an opportunity to add a seam of gold to our souls. And this year has been particularly trying. This year I have added several gold seams. Realising that Kintsugi can be a metaphor for life, though, has made me feel more comfortable with the challenges I have faced - and those that are still to come. I love this idea! I almost want to rush out and break some china just so that I can repair it with gold.